The Patriots face the Buffalo Bills this week in Foxborough coming off a tough loss to division rival Jets. Buffalo has come off two tough games and currently stands 0-2, having been blown out by Green Bay 34-7 last week. They’re making a quarterback change, have a new coaching staff and is generally a team in transition looking to find its identity. Its likely to be a long season for the Bills and the Patriots are about their worst nightmare for years upon years now. The Bills have not beaten the Patriots since 2003 and many of the losses have been blowouts. Last year they put up a reasonable fight, losing by 1 point and 7 points. While there is some talent at individual positions, its still a work in progress as the coaching staff tries to install its program. If the Patriots can’t win this game convincingly, and show on defense it can stop one of the poorer offenses in the league, it should justifiably lead to questions exactly what this Patriots team is going to be this season. In any event, lets look at a few key Bills for this game. Chan Gailey, Head Coach: Gailey was named the 15th head coach of the Bills this season and it is his second NFL head job. He has also been a head man in college at Troy State, Stamford and Georgia Tech. Overall, he’s had some success, if modest, at almost every stop he has been to. In the NFL, he had a difficult task of taking over a Dallas Cowboys team that was only a few years removed from three Super Bowl victories. And 18-14 regular season record and two playoff appearances in two years wasn’t enough to placate the demanding Dallas owner Jerry jones and Gailey was let go. He then headed down to Georgia Tech for a 6 year stretch in which he made a Bowl game every season. Its interesting to note Patriots assistant Bill O’Brien, who essentially acts as offensive coordinator, was Gailey’s offensive coordinator and assistant head coach Gailey’s first year at Georgia Tech in 2002. Gailey went a combined 44-32 at Georgia Tech, but it wasn’t enough and he was let go after the 2007 season. He now gets another daunting task restarting the Buffalo franchise. He has a good offensive mind and his teams generally have had solid offenses. It will be interesting to see whether he can get Buffalo to be more patient than Dallas was and what strides he can make with the Bills. One last factoid, Gailey was offensive coordinator of the 2008 Chiefs team that played the Patriots opening day (the Tom Brady injury game) and the Chiefs lost that game 17-10, far from a dominating offensive performance. The Chiefs went 2-14 that season. Ryan Fitzpatrick was named starting QB this week. 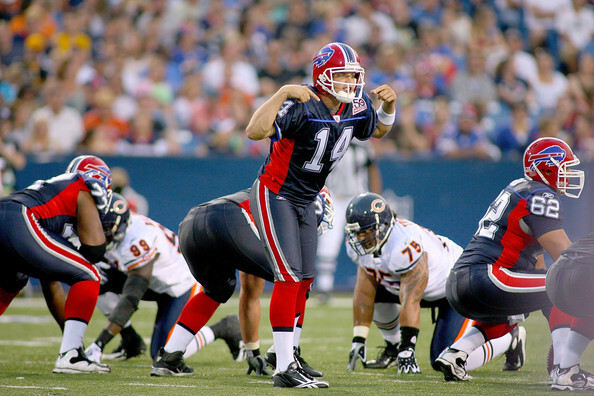 Ryan Fitzpatrick (#14), Quarterback: A Harvard grad, Fitzpatrick is taking over again as the Bills starter this week for the benched Trent Edwards. Fitzpatrick is a smart quarterback with a very strong arm but simply lacks accuracy and that has caused him to have limited, at best, as a quarterback in the NFL. He certainly can do a competent job filling in and even occasionally make some excellent throws and plays, but he just hasn’t shown an ability to do it consistently. He can scramble a bit and can even throw on the run, so that is something the Patriots will have to look out for. The team also seems to have a bit more confidence in him than the leadership challenged Edwards. Perhaps Fitzpatrick will prove to be a better fit in Chan Gailey’s offense. And given that the extremely mediocre Mark Sanchez of the Jets lit up the Patriots defense last week, its not beyond the realm of possibilities Fitzpatrick could have a good game Sunday. But if he does, it may well say more about the Patriots defense and the struggles they’ll face all year against the pass than anything really positive about Fitzpatrick. Fred Jackson (#22), Running Back: Jackson is an unlikely NFL success story. He bounced around for years playing in the United Indoor Football League and NFL Europe before finally establishing himself with the Bills a few years back. Last year the hard running Jackson topped 1,000 yards and caught 46 passes in addition. The Patriots players and coaches have always been complimentary of Jackson, who obviously gives a good, tough, physical effort when he is in the game. Not overly speedy, he does run with power and can evade a tackler here and there. This season, Jackson hurt his hand in the first preseason game and is still just working his way back to being healthy. He is back playing and his workload has gradually increased. He had 9 carries last week and given his generally strong performances in the past versus the Patriots, we’ll probably see a lot of him Sunday. Lee Evans (#83), Wide Receiver: Evans has always been a favorite at this address. He seems to have it all, speed, good hands, quickness, run in space ability and he stays on the field. But something is missing. His lack of production has long been chalked up to the lack of an elite quarterback in Buffalo and the lack of surrounding alternative weapons. Undoubtedly that plays a part in his relative lack of big time success. But Evans is now in his seventh year and coming off a 600 yard season with only 34 yards thru two games this year. What is the deal with that? Its not that he’s never had success, he has two 1,000 yard seasons under his belt, but an elite receiver? Hasn’t become that. And the slip in his production the last two years is not a sign Evans is trending in the right direction either. Buffalo fans have understandably gotten frustrated the talented Evans hasn’t been more productive. His wikipedia page currently humorously reads of this writing: “He runs his routes, never gets a pass thrown his way (because he runs down the field, and Trent Edwards is incapable of throwing a football more than 4 yards down field), never gets hit, and gets paid multi-millions of dollars.” Still, the quick and speedy Evans is the Bills best weapon in the passing game and given the Patriots struggles defending that so far this year, he is a player that needs to be watched. Aaron Maybin (#58), Linebacker: Maybin was the Bills first round choice in 2009 out of Penn State who had a tough time with transition to the NFL and didn’t produce much of an impact. For his reason season, Maybin only managed 18 tackles and no sacks. It was pressure Maybin had been hoped to produce when drafted by the Bills, but he struggled in a move from college to the NFL and this year is moving from a 4-3 defensive end to the 3-4 outside linebacker the Bills now want him to be. In training camp this season, Maybin was impressive and appeared to have come a long way. But once the regular season began, Maybin once again has struggled thru two games and he only has two tackles so far. While Maybin is athletic and strong, one thing he may lack to ever be the dominant pass rusher the Bills envisioned is speed and quickness. He just isn’t very much of either. When you throw in a position change, his reactions are slow and it leads to poor play. Maybin may end up someday being a good NFL player. But it may well be that it will be different than originally envisioned. As said, he is tough, plays hard and very physically strong with good size. His skill set sounds more like an that of an inside linebacker than outside and that may be where eventually he finds success. Say “Champ Bailey” while holding your tongue and it will sound like the name of the Bill’s head coach. it’s fun!